Jane grew up in Des Moines and in the Lutheran Church where she discovered she had a knack to "make church fun." She moved to Chicago in the early 80s, just after college, to pursue improv and stand-up comedy. She moved to LA in the later 80's to continue these pursuits. In her adult life she found her spiritual home in the United Methodist Church and after a surprising call in the desert on Good Friday (really!) 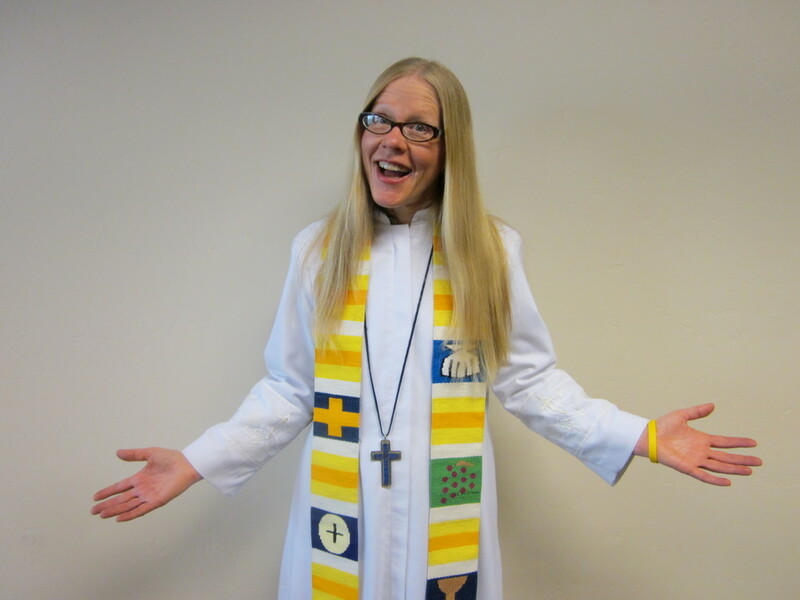 she transitioned into ordained ministry, with a desire to continue developing her passions and gifts for comedy and fun-making for the church and faith walk. She graduated from the Claremont School of Theology in 1996. There she created an improv troupe of seminarians called Angelic Residue; they played improv games with scripture and were a huge hit everywhere we went (not to brag - thanks goes to God!). She's served churches in West Los Angeles, Appleton WI, San Luis Obispo and last year was appointed to take a first stab at creating a full-fledged Comedy Church in Toluca Lake (next to Burbank). After that experiment ended she went on "family leave" to care for her parents in Waverly and continuing her pursuit of building new bridges between comedy and theology. She began writing a blog that explores the Bible from a comic angle, The Comic Lens, as well as developing, producing and performing a unique variety show entitled, The Bible Cabaret: A Comedy and Music Review Starring the Old and New Testaments. On July 1, 2018, Jane returned to Southern California and began a new pastoral appointment at the (fabulous!) United Methodist Church in Palm Springs. In her spare time she collects polyester pant suits and figures out how to connect dots.